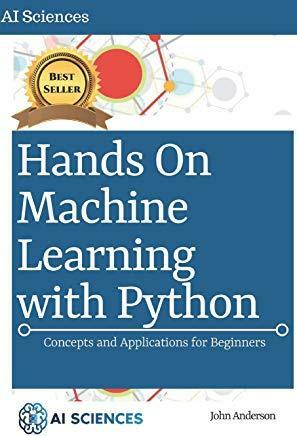 7***** BUY NOW (will soon return to 24.77 $***** MONEY BACK GUARANTEE BY AMAZON (See Below FAQ) *****Are you thinking of learning more about Machine Learning using Python? (For Beginners)This book is for you. It would seek to explain you all need to know about machine learning and its application using Python in an intuitive way. From AI Sciences Publisher Our books may be the best one for beginners; it's a step-by-step guide for any person who wants to start learning Artificial Intelligence and Data Science from scratch. It will help you in preparing a solid foundation and learn any other high-level courses.To get the most out of the concepts that would be covered, readers are advised to adopt a hands on approach which would lead to better mental representations. Seasoned professionals in the field of artificial intelligence and machine learning who desire a bird's eye view of current techniques and approaches. Q: Is this book for me and do I need programming experience?A: If you want to smash Machine Learning from scratch, this book is for you. If you already wrote a few lines of code and recognize basic programming statements, you'll be OK.
Q: Does this book include everything I need to become a Machine Learning expert?A: Unfortunately, no. This book is designed for readers taking their first steps in Machine Learning and further learning will be required beyond this book to master all aspects of Machine Learning. Q: Can I have a refund if this book doesn't fit for me?A: Yes, Amazon refund you if you aren't satisfied, for more information about the amazon refund service please go to the amazon help platform. We will also be happy to help you if you send us an email (email address inside the book). ***** MONEY BACK GUARANTEE BY AMAZON ***** Editorial Reviews"This book succeeds in covering most important techniques in a clear, intuitive way that is perfect for newbies and those seeking to improve their practice in the Machine LearningFields VERY QUICKLY ."